Get yourself an SUV that will change how you feel about driving and commuting each day. The 2019 Honda HR-V for sale in Fontana, CA, is an amazing new vehicle that will make your experience as a car owner much more enjoyable. The Honda HR-V is available in five trims, including the LX, Sport, EX, EX-L, and Touring. Every trim offers the same infallible performance, but each one gives you varying technological features, special performance features and more. No matter what trim you choose, you are guaranteed to love your 2019 Honda HR-V. Test drive today here at Rock Honda, conveniently located near San Bernardino and Rancho Cucamonga, CA. The 2019 Honda HR-V near Rancho Cucamonga, CA, has fun and new available technology built in. A seven-inch Display Audio touchscreen makes all of your tech easy to reach. This feature is in the EX, EX-L, and Touring trims. The available HondaLink™ system allows you to save your parking location, schedule a service appointment, check your fuel and more. Enjoy your drive using the available SiriusXM® satellite radio. Select trims also come with the incredible Honda Sensing®, which features tons of safety and driver assist technology. Honda Sensing® includes lane keep assist, road departure mitigation, collision mitigation, and adaptive cruise control. Make calls or send messages using the available Bluetooth® HandsFreeLink®. Interior seating options for the 2019 Honda HR-V in Fontana, CA include high-quality, durable cloth and premium leather. This SUV has an inline four-cylinder engine that delivers 141 horsepower and 127 lb.-ft. of torque. This car also comes with an EcoAssist™ system that allows you to maximize fuel efficiency. 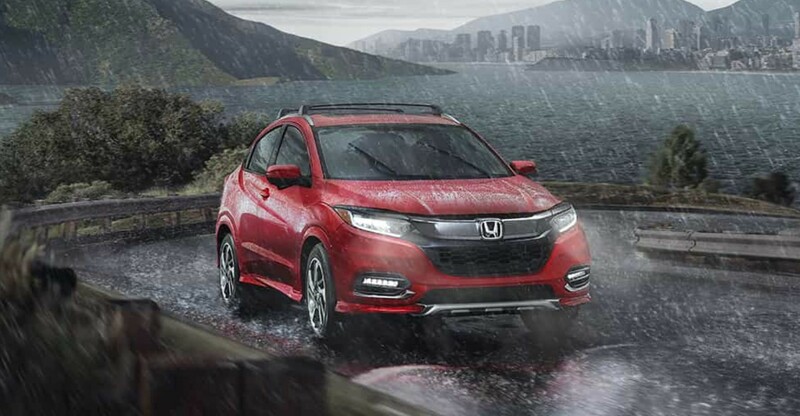 Learn more about the 2019 Honda HR-V when you visit Rock Honda here in the Inland Empire. When you come to our dealership, you will be met with our excellent helpful team members who can help you from start to finish. After picking out your new car, we will help you secure a financing option with the lowest interest rate possible. If you are hoping to customize your new Honda, ask us about available accessories, packages or group options. Visit us at Rock Honda today!